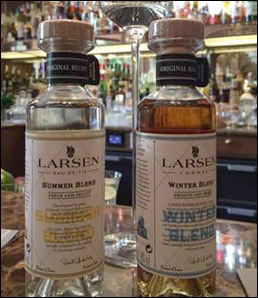 Focusing on bartenders, Cognac Larsen has launched two new blends. Summer Blend eaux-de-vie and Winter Blend cognac are designed to be used in cocktails and mixology, to create seasonal, summer and winter cocktails. Rather than focusing on age and age categories (no reference to age appears on the bottle) the emphasis is on fruit, flavour and aromas, thanks to ageing without lees and light oak-ageing. Summer Blend and Winter Blend are two original and unique recipes that represent a different take on cognac and eaux-de-vie- de vin from the Charente. Larsen Summer Blend is delicate eaux-de-vie-de vin fine. It is a blend from the double distillation (charentaise) of a single cépage (Ugni Blanc) wine, produced in the 'dorsale de Saintonge' region of the Charente. It has been aged for six months in small oak casks. Larsen Winter Blend is a fruit-driven Cognac…‘Un Cognac Gourmand’ according to its creators. The house of Larsen, now part of the Finnish group, Altia, celebrates its 90th Anniversary this year. It was founded by Jens Reidar Larsen, a Norwegian adventurer and Cognac-lover, who set off to explore France, visited the South West and decided to set up a Cognac house there. Larsen never went home but Larsen’s Nordic roots and spirit of adventure of its founder are reflected in the brand’s iconic emblem: the Viking ship or drakkar. Cognac Larsen joined the Altia group in 2013.